Public sector institutions, created in response to crisis, often outlive their usefulness. A case in point seems to be Beacon Mutual Insurance Company of Rhode Island. Most Insider readers are probably aware of the currently escalating catastrophe triggered by the audit report delivered April 14th by the committee headed by former Governor Lincoln Almond. Since I’ve observed the saga from the beginning and have intimate knowledge of the politics involved in how it came to be, I’d like to offer a personal perspective. The saga begins in 1990. Those who have been in the workers’ compensation arena since at least Ronald Reagan’s last term will recall the national crisis of the late 80s and early 90s. By way of example, in my home state of Massachusetts, 1992 total workers’ compensation insurance premiums were nearly $2 billion; now, premiums total around $800 million. Rates are where they were in 1981. Quite a turnaround. Starting in the late 1980s, Lynch Ryan had done a lot of consulting business in our neighboring state, Rhode Island, because workers’ compensation problems were no different there. For a tiny state, costs were on a rocket ride to the moon. Of course, for insurers, as in most states, the problem manifested itself in the Residual Market, or assigned risk pool. Not enough premium going in, coupled with ever increasing losses, meant that the pools had insufficient money to pay the incurred value of claims, resulting in huge residual market deficit charges to insurers. Something had to give, and what gave is what usually gives in these situations. Insurers voted with their feet and stopped writing business in many industrial states, including Massachusetts, Rhode Island, Maine, Texas, California…the list is long. All of which caused the already flaming assigned risk pools to blaze even higher, like a bonfire with fresh gas. Different states reacted differently. In Massachusetts, a bi-partisan reform of the law, combined with the creation of the Qualified Loss Management Program, slowed, stopped and, by 1994, started to reverse the run-away train. Rhode Island, Maine, Texas and California approached the crisis from other angles. For example, Texas decided to amend its law to allow employers to “opt out” of the workers’ compensation system altogether (I can remember flying to Texas to be interviewed for the McNeil Lehrer Hour on PBS and opining that “The Texas Legislature should be ashamed of itself.” National TV exposure can get one to spew hyperbole). In addition to statute reforms, giant California, Down East Maine and little Rhode Island created state funds to take over their assigned risk pools. California’s difficulties are long-standing and well-documented. Maine hired away from Travelers the exceptionally competent John Leonard. Regardless of whether one liked the idea of the creation of these state funds, which I didn’t, John made the thing work, and work well in Maine (Young and foolish, I can also remember saying in an interview that the states were “sweeping their problems under the carpet so posterity could trip over them.” Sorry, John, one lives and learns). In any event, by the mid to late 90s, and putting aside some noteworthy state exceptions, the national crisis was becoming a national memory as costs dropped, insurers re-entered the marketplace and management, especially at NCCI, began to breath again. NCCI’s then president, Bill Hager, gave his famous “Back From The Brink” speech at the council’s 1995 annual meeting, during which the attendees heard Bill loudly proclaim, “We’re back from the brink!” 27 times. I thought then, and still think now, that when the tide turned and costs fell, the great state of Rhode Island, taking a page from its native son, Major General Nathaniel Green, should have declared victory, folded its tents and, with trumpets blaring, left the field in triumph. But that did not happen. Beacon Mutual, the company created with $5 million of state taxpayer money, the company that, to this day, has never paid taxes or contributed to the Guarantee Fund, got the Rhode Island legislature to approve its writing business in the voluntary market, eventually becoming Beacon Mutual, yet retaining its “special status” as a state fund. And, despite the good work done by many of its employees, Beacon Mutual, precariously straddling the razor-thin fence that sometimes separates the public from the private sector in Rhode Island, inevitably became a candidate for political and economic corruption. Beacon was allowed to set it own rates and could underbid any other insurer that had the temerity to want to write business in the state. It did “most favored nation deals” with certain agents and employers, some of whom, until last week, sat on its Board of Directors. Competition became non-existent. Although 60 carriers are licensed to write workers’ compensation in Rhode Island, Beacon Mutual insures 76% of the state’s premiums ($160 million) and 90% of its employers and wanted more by expanding to other states. But along the way to becoming Goliath, Beacon Mutual picked a fight with someone armed with more than a sling shot, Governor Don Carcieri, who, given the Almond Report, seems committed to making the company bend to his will. It will certainly be interesting to see how this whole thing plays out. Sort of like watching Rome burn. But for me, the bottom line is this: states should not set up insurance companies. And if they do, they should get out of the business as soon as is humanly possible. “We were worried and afraid, but we began to accept our fate. Junior Toler led us all in the Sinners Prayer. We prayed a little longer, then someone suggested that we each write letters to our loved ones. I wrote a letter to Anna and my children. When I finished writing, I put the letter in Jackie Weaver’s lunch box, where I hoped it would be found. As of mid-April 24 coal miners have died at work. But that is only part of the story. Every day in the United States, an average of 16 workers die from occupational injuries. Death on the job: the toll of neglect is the AFL-CIO’s just-released 15th annual report on the state of safety and health protections for America’s workers. This extensive 158-page report includes both national and state-by-state profiles of safety, workplace fatalities, injuries, illnesses, the number and frequency of workplace inspections, penalties and public-employee coverage under the Occupational Safety and Health Act (OSH Act). It should be mandatory reading for all business managers and owners. Jordan Barab has taken the time to cull out and summarize some important portions of this report. Also timely today, The Workplace Dirty Dozen – America’s Dangerous Employers (PDF) – a report by The National Council for Occupational Safety and Health. Alarm One Inc. is in the home protection business. They install and monitor security alarm systems – serious business, or so you would think. A former employee, Janet Orlando, 53, is suing the company for $1.2 million in damages for the embarrassment of being spanked in front of coworkers. She quit her job in Fresno CA and sued, alleging discrimination, assault, battery and infliction of emotional distress. What’s the matter, Janet, don’t you like to have fun? The facts of this bizarre case are not in dispute. Up until the practice was stopped in 2004, employees at Alarm One Inc., were routinely paddled, using the sign boards of their competitors, in a contest that pitted sales teams against each other. Winners threw pies at losers, fed them baby food, made them wear diapers and swatted them. Just your ordinary, All-American fun place to work. Defending the company (no easy task! ), attorney Poncho Baker said that the spankings were part of a “voluntary program to build employee camaraderie” and were not discriminatory because they were given to both male and female workers. In other words, Alarm One is an Equal Opportunity Harasser. It’s interesting that Alarm One’s unusual morale building exercises were dropped not because they were perceived to be immature, humiliating, and totally inappropriate, but out of fear that someone might get hurt. An employee filed a comp claim for injuries suffered during this, well, work-related team-building exercise. (We posted on the compensability of a spanking injury here.) In other words, the specter of increased workers comp costs brought the fun-filled staff meetings to an end. Sigh. It’s nice they figured out that the activity had to stop. I’d feel better about it, however, if they stopped the nonsense for the right reasons. You have a valued employee – a good producer – with a drinking problem. Ever since a traumatic divorce, his performance has suffered. He misses a meeting with a major client. You encourage him to seek help through the Employee Assistance Program. He voluntarily enters a detoxification program. He participates in Alcoholics Anonymous twice a week. He sees a counselor. Yet his performance continues to erode. You suspect he may be drinking again. You call him into your office. He seems a bit spacy – might be taking a decongestant for a cold. You don’t smell any alcohol, but you ask him if he had been drinking. He looks at you unflinchingly and says no. You give him yet another stern warning that unless his performance improves immediately, you will have to terminate him. You’re trying to be a good manager. You really want to help this guy, a valued employee. But how far do you go? When do you draw the line? You shake your head as he walks out of your office. The last thing on your mind at that particular moment is being sued for negligence. But for Ed Arlin, a manager at Unigraphic Solutions (UGS), that’s exactly what happened after Thomas Wellinger left his office on May 3, 2005. Some three hours later, apparently on his way to an appointment with his psychiatrist, Wellinger drove his car at 70 mph into another vehicle, killing a mother and her two children. He was intoxicated to the point of no return, with a blood alcohol level at the literally staggering level of .40. Where did Arlin go wrong? Did he wait too long to take action? In trying to help Wellinger, did he become an enabler? Wellinger was just sentenced to a minimum of 19 years in prison. But the case does not end there. For Arlin and other managers at UGS, there is no end in sight. Gary Weinstein, whose family was wiped out on that fateful day last May, has filed a civil suit. So far, the police have been unable to trace Wellinger’s movements on the day of the crash. So Weinstein cannot sue a bar for serving too much liquor. His only recourse at this moment is to sue the employer, who last saw the employee some hours prior to the accident. And based upon police reports, no one at the employer, Arlin included, had any awareness that Wellinger had been drinking on that day. My guess is that there will be a settlement – a large one, at that. Even though UGS managers appeared to be on top of the situation; even though they made the accommodations that we hope considerate employers will make; even though they apparently had no direct knowledge of Wellinger’s impairment on that particular day. Despite all of these factors, they are still likely to pay. Why? Because an innocent party has suffered tremendous harm and UGS, with its deep pockets (AKA liability insurance), is closest to the situation. Without question, Wellinger himself is responsible for what happened last May. He’s on his way to jail. But in our system, every decision made by his employer will now be carefully scrutinized. If UGS could do it over again, they probably would have terminated Wellinger when his drinking resumed after detox; while recovering alcoholics are a protected class under the Americans with Disabilities Act, there are no such protections for active drinkers. UGS, in trying to do the right thing by Wellinger, ultimately made a wrong decision. It’s a managers’ nightmare. You make decisions every day, in the course and flow of the business. You have no way of knowing which decisions will come back to haunt you. As he wends through the civil trial with its endless depositions and testimony, Ed Arlin will have more than enough opportunity to second guess himself. It’s not going to be easy for a manager who was simply trying to do the right thing. NOTE: For additional background on this situation, check out our prior blogs here and here. Hotel worker risks – Your comfort is a pain in the neck for many hotel workers – literally. Jordan Barab at Confined Space posts on how the increasingly plush bedding that hotels use to lure guests – duvets, double mattresses, down pillows – are adding to the injuries experienced by hotel workers. “Still other research, by Orr Consulting, a firm dealing in ergonomics, found that the strain of making 12 or more king-size beds a day — many with 115-pound mattresses, 14-pound duvets and three sheets instead of two — exceeded federal occupational safety guidelines on lifting. And in a recent Unite Here survey of 622 housekeepers in Boston, Los Angeles and Toronto, 91 percent said they had work-related pain, 67 percent had gone to doctors because of that pain and 66 percent took medication for it. More on popcorn lung – Artificial flavorings added to popcorn and other snack foods pose a serious threat to workers in the food industry and government watchdog agencies offer little in the way of protection, instead leaving the industry police itself. Francisco Herrera, a 32 year-old worker and father of two who suffers from disease that has destroyed 70 percent of his lungs wonders why, when everyone knew that the diacetyl was harmful. no one told the workers who handled it. In a must-read special report entitled Disease is swift, response is slow, The Baltimore Sun discusses this issue at length. Found via Jordan Barab at Confined Space, who has been blogging the popcorn lung issue thoroughly for several years now. Kudos – to B. Jannell Grenier for the 3-year blogiversary of Benefitsblog, an excellent resource for tax, benefits, and ERISA law. 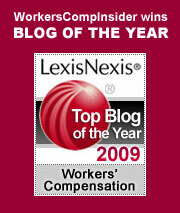 Because the blog’s topic matter is somewhat peripheral to workers comp, we don’t pick up stories often, but it is a quality resource and a frequent read. Don’t miss the wealth of carefully-chosen links at the end of the page! Certificates of insurance – Specialty Insurance Blog highlights recent litigation that illustrates why the proper handling of certificates of insurance can be so important to agents and brokers. “The government’s point man on Sept. 11 health programs said he is worried that an autopsy linking a retired detective’s death to recovery work at ground zero may be a warning sign of other life-threatening cases. Keep choice on the Internet – Beyond workers comp, we don’t editorialize too often, but this is a topic near and dear to us, and if you are a blog reader, probably to you too. Is open access to the Internet important to you? Do you want the choice of independent sites or would you prefer to have your ISP slice, dice & package the Web much like cable TV? If you prefer choice and broad access, you may want to let your congressman know today. Pending legislation deals with abandoning “network neutrality” and there aren’t too many lobbyists on the side of the individual web user. Here’s a video clip that explains the issue, and here’s an overview from Josh Marshall with some links for further action. When a business travel bargain may not be a bargain. The recent surge of activity by agents of the U.S. Immigration and Customs Enforcement (ICE) brought to mind Eugene O’Neill’s 1939 play, The Iceman Cometh. The ICE men and women recently raided IFCO, a manufacturer of pallets and pallet systems, arresting a number of managers and, most notably, somewhere around 1,100 illegal immigrants who were working for the company. (Read more at working immigrants here.) ICE has about 325 agents across the country. If this enforcement crew were to arrest 1,100 illegals a month (not likely, as it takes a long time to set up the bust), it would take them over 10,000 years to clean up the problem. That timeframe would probably satisfy the many people who fear the solutions more than the problem. IFCO’s press release following the arrests states that the allegations are “counter to everything we stand for.” Well, we must assume, not quite everything. Ironically, they manufacture pallets for the harvesting industry, products used by thousands of undocumented migrant workers toiling in fields across America. We all know what the problem is: we have about 12 million undocumented workers throughout the country. Most are working, providing a wealth of services in jobs that native born Americans seem reluctant to undertake. Because they are illegal, they function for the most part as second class workers, with limited benefits, lower wages and few protections. Their relatively inexpensive labor is a huge boon to our economy. So while some clamor to throw them out, others say let them stay and become citizens. Either solution would result in substantially higher costs for doing business. Given the downside of both proposed solutions, the Insider’s guess is that we will muddle along with no significant changes. Congress will debate the issue endlessly, but will likely conclude, as they have done so far this year, that doing nothing is easier than doing something. Thousands of illegal immigrants will continue to slip through our porous borders every month. Millions of undocumented workers will continue to function with substandard wages and benefits, all the while fearing the day the ICEmen cometh. It’s business as usual, wink wink, with no one quite willing to confront reality. We are living the lie that “gives life to the whole misbegotten mad lot of us.” Perhaps the notion that we could actually fix this enormous problem is the biggest pipe dream of all. That’s a sobering thought, indeed. State Premium Ranking – Thanks to Mike Manley for pointing us to the 2004 Oregon Workers’ Compensation Premium Rate Ranking Summary, which offers a comparison of premium by state. Mike is the Research Coordinator at the Information Management Division of Oregon’s Department of Consumer and Business Services. He also points us to some other workers comp studies that look very valuable – thanks, Mike. Her comment led us to the Working Injured Nurses Group or WING USA, a site that provides information, advice, and support to injured nurses. Anne is a founder of this group as well as co-author of Back Injury Among Healthcare Workers: Causes, Solutions, and Impacts. She has been active in championing the cause of back-injured nurses – both in terms of prevention and also in advocating for reemployment of injured nurses in positions that don’t require lifting. We appreciate informed comments from our readers. If you have resources, information, or just opinions, we encourage you to jump in! The Insider has long puzzled over the decision-making process of doctors treating injured workers. Why do they rely so heavily on expensive pain killers when over-the-counter medicine might do the job just as well? Why do they choose one knee replacement part over another? Why are so many doctors quick to certify a disability, when the injured worker retains much of his or her ability to function? Why do so many doctors fail to see the relationship between being productive and being healthy? As fellow-blogger Julie Ferguson pointed out yesterday, twenty one doctors with an interest in occupational medicine have published a fascinating report on the medical aspects of disability. Their white paper is entitled: Preventing Needless Work Disability by Helping People Stay Employed. It’s a must read. From our perspective, the white paper is a 52 page symphony, closely aligning all the disparate players in the disability world. These doctors, affiliated with the American College of Occupational and Environmental Medicine (ACOEM), understand the problem and they propose realistic solutions. there is no practical way to keep a vulnerable employee safe at work. physicians do not see disability as an outcome for which they are responsible. The white paper describes in compelling detail the many factors that prevent the medical delivery system from carrying out its fundamental role: “do no harm.” If a doctor enables an injured worker to become a disabled person, he or she has indeed done much harm. The goal should always be to keep disabled people working: rather than fitting the injured worker to the benefit (workers comp, STD/LTD), keep the focus where it belongs: Staying at work. And for those who must lose some time, returning them to productive employment as quickly as possible. This draft paper is worthy of widespread attention, not just among professionals who are directly involved in medical services, but among all of us who struggle with the issues of risk management, disability management and productivity in the workplace. The paper does not place the entire responsibility for fixing the current problems on the medical system. Insurers have a role, as do the employers whose workers are injured. Right now, it often seems that every special interest pulls in a separate direction. This white paper is a blueprint for bringing us back together, where we truly belong. Fard Johnmar of Envisioning 2.0 gets some help from an illustrious wonk in hosting the latest carnival of the creme de la creme of recent health policy-related blogging – Health Wonk Review #5. Plan to stay awhile – lots of good reading! Today’s must-read list: Give disabled workers every reason to remain part of your work force – an article discussing a report by the American College of Occupational and Environmental Medicine (ACOEM) on the Stay at Work/Return to Work process. The report discusses the psychological, emotional, and economic impact of disability on the individual. Read the full report: Preventing Needless Disability by Helping People to Stay Employed (PDF). Peter Rousmaniere’s column in Risk & Insurance this month – How to Avoid Getting Scalped – a look at Ambulatory Surgical Centers and their lack of transparency in billing practices. It’s worth a read. Rhode Island – Looks like Ohio may have some company in terms of workers comp scandals. Business Insurance reports that Governor Carcieri is calling for the termination of Beacon Mutual Insurance Company’s CEO Joseph Solomon after a recent report detailed questionable practices and preferential pricing. Insurance Journal reports that Solomon and the VP of underwriting have both been suspended without pay, at least until a meeting scheduled for today. This is a big shakeup for an organization that writes about 90% of the state’s workers comp policies. Beacon Mutual was created by the state in 1991 as a nonprofit independent corporation. Scaffolding – In Boston, work has resumed at the site of the recent scaffolding collapse. The state is considering proposals that would assign scaffolding inspections to the Department of Public Safety, as is the case with cranes at construction sites. This political football will no doubt be tossed around for awhile. Meanwhile, a new scaffolding collapse in Milton Keynes , UK has dominated the headlines this week … another worker killed. The BBC depicts the collapses in pictures. (via rawblogXport). Employee Mutiny – You know things are bad when your work force quits en masse, leaving only a note on the door. Hospital Impact discusses this event, and raises other issues of employee morale and work force motivation in an interesting post that we found via Rita at MSSPNexus.